Though not widely read anymore, Leiber's Fantasy stories have had a huge influence on the genre. 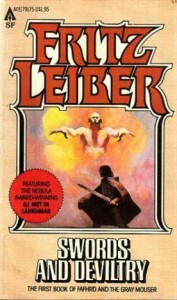 There probably would not be Rouge, Thief, or Assassin classes in Dungeons & Dragons if Leiber had not written the Fafhrd and the Gray Mouser series. The first collection includes "Ill Met in Lankhmar" which is one of the best in the series.